Tell Your Friends. It's a 12 hour mowing/barbecuing/fun event. 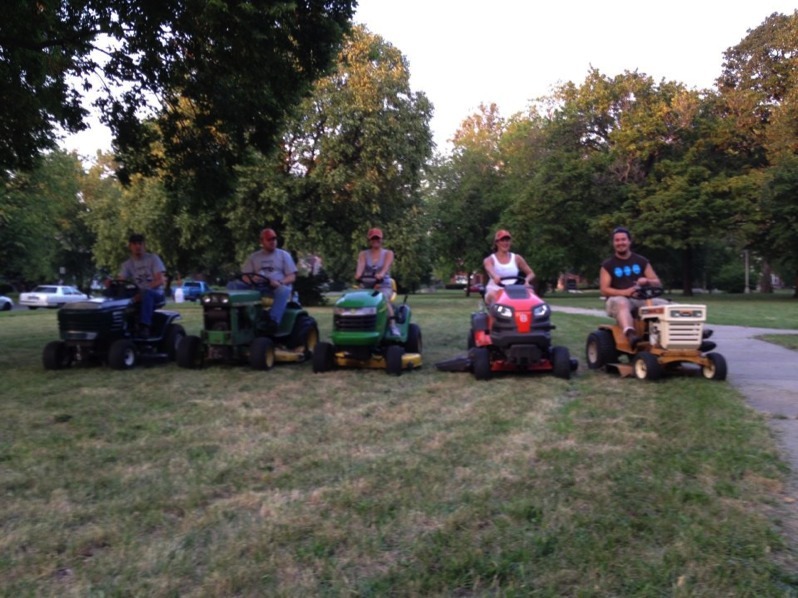 The Mower Gang is hosting a Mow-A-Thon unlike any you have ever seen. For 12 hours straight we'll mow as much parkland as we can. You should join us. You can Register for the Motown Mowdown here. It is free of charge and there will be rewards for hard work. We will be all over town, with the overnight portion contained within our home park of Dorais. Date: The Saturday of the weekend before Memorial day. May 21st, 10AM, Starting at O'Shea Playground (SW corner of I-96 and Greenfield Rd.). There is no rain date, we mow rain or shine. What It Is: The event will last for 12 hours. During that time, teams will try to keep their equipment running for as many of those hours as possible while we clean and mow as many Detroit playgrounds and parks as possible. Who: The Detroit Mower Gang is a group of volunteers that clean and mow the abandoned playgrounds of Detroit. Everyone is welcome in the gang. You don't even need equipment. If you want to join, just post here and ask to be included in a team. Who Is Making This Possible: Volunteers like yourself make this possible and Husqvarna is helping us do great work by donating really great equipment. Why: Because kids need a place to play and they can't cut their own grass. How: We will mow as much as possible in any way possible. Members bring their own lawn tractors, push mowers, weed whackers, blowers, and work gloves. How Much Does It Cost: It is Free! There is no entry fee or anything like that. You also don't get paid. It's sorta a zero-sum type of deal. Schedule: 9:30-10AM - Arrive and check in (O'Shea Playground). 10AM - Start Mowing! until O'Shea is done. Then on to the next park, then the next, then the next. We will use phones to let you know where we are heading next and to let the public where we are. 1PM - Lunch - We meet someplace for lunch. We choose a place with lots of parking and a bathroom. Lunch is usually paid for by a sponsor. We are still seeking one at this time. 7PM - Dinner (do hot dogs count as dinner?) at Dorais Playground (our home park where we will have porta johns and we will be spending the night. 10PM - The end of the official event. Also known as Hard Liquor Hour. Is it hard work: Yes. Is it the kind of work you will be proud of: Yes. Why do you do it: Because it feels good to help people and because when you do good things, you meet good people. How Many Parks Do You Cover - In 2013 We covered 13. In 2014 We may finish 15. In 2015 we did 21. What does it take to win? Grit, Determination, and the avoidance of buried treasure out in the tall grass. Does it cost anything? There is no entry fee. Participants bring their own equipment and gas. Sponsors will provide food, beer and there are always some prizes. There is a championship belt for the grand champion and free stuff for other winners. Craftsman has also donated a 200 piece tool kit to the champion for 2016. Are you really going to work for 12 hours? Yes. We are going to try to push our bodies and machines to the limit. Why? Because kids all over Detroit deserve to wake up Sunday morning to a clean, mowed, useful playground. How do I sign up? You can Register for the Motown Mowdown here. It is free of charge and there will be rewards for hard work. Are teams forming? Yes. Gang members are forming teams. Please attend any Mower Gang event to meet the gang members and join them. If you can't attend, try to post on our Facebook page that you are looking for a team. Let people know what experience you have with mowers and what you bring to the table (for example you might say "I have sat on a mower at home depot before and I will bring a 12 pack of beer"). What is the secret to victory? We aren't sure. This is the first event of its kind, but our extensive mowing of the parks indicates that in order to keep mowing you will need to avoid large rocks, buried car jacks, and discarded clothing. A pair of jeans can take half an hour to untangle from your mower blades. You will have to keep your body fueled up without getting too drunk, and you'll have to make sure that your engine has oil inside of it. The winning team will almost certainly contain at least three drivers to share the punishment. Prizes? : We have some, but not many. If anyone is interested in sponsoring the event and/or donating prizes, please contact Tom: mowergang@priveco.com We could use your help. I'm not around, how can I help? You can be loyal to our sponsors. Craftsman tools are a great brand, you can find them at Sears and K-Mart. If you need a bulletproof vest, BulletSafe is a great choice. Where do I sign up? You can Register for the Motown Mowdown here. It is free of charge and there will be rewards for hard work.